The soon-to-expand home of Hop Farm Brewing Co. Photo by Tracy Certo. Hop Farm Brewing Co. has big plans on tap for 2019. 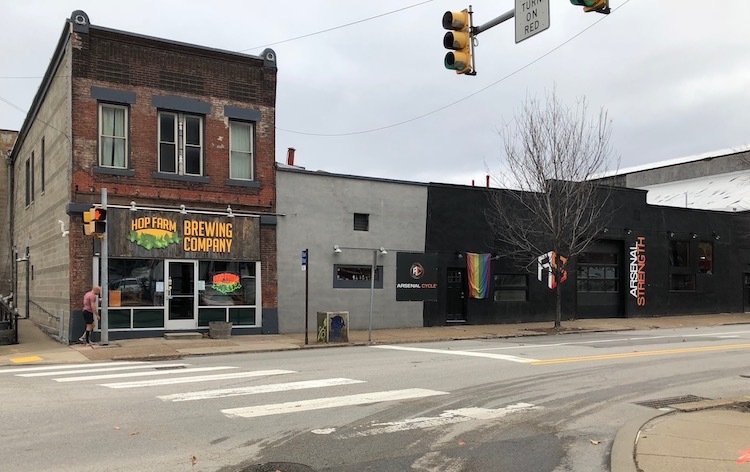 This week, the foodie favorite taproom and brewery will formally roll out plans to expand its flagship location into the neighboring buildings on Butler Street in Upper Lawrenceville. 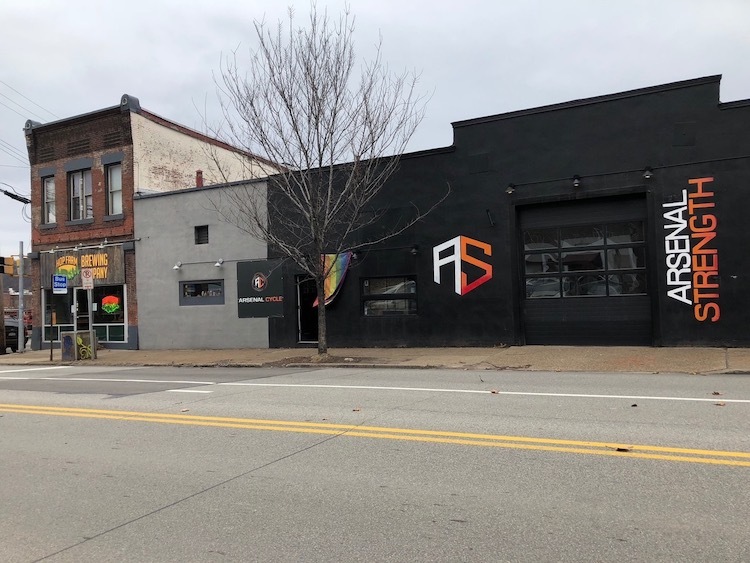 The expansion will take the beer emporium into space currently held by the fitness studio Arsenal Strength, which will move further east up the street into a former car wash. The brewery’s proposal will go before the Pittsburgh Zoning Board of Adjustment on Thursday. Pending approval, the brewery’s owners say they plan to be fully moved into the 7,000-square-foot space formerly occupied by Arsenal by December of 2019, bringing the entire brewery’s footprint to 12,000 square feet. Last year, co-owners Matt and Emily Gouwens bought the current building at 5601 Butler Street after renting for several years. Speaking to NEXTpittsburgh, Matt Gouwens said that the purchase and expansion will allow the brewery to better serve its growing clientele. 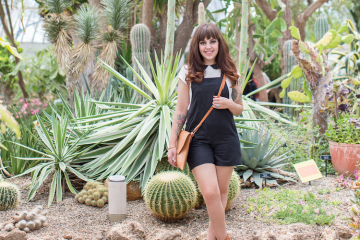 The Cleveland-based architecture firm FMD is already working on designs for the expanded space. 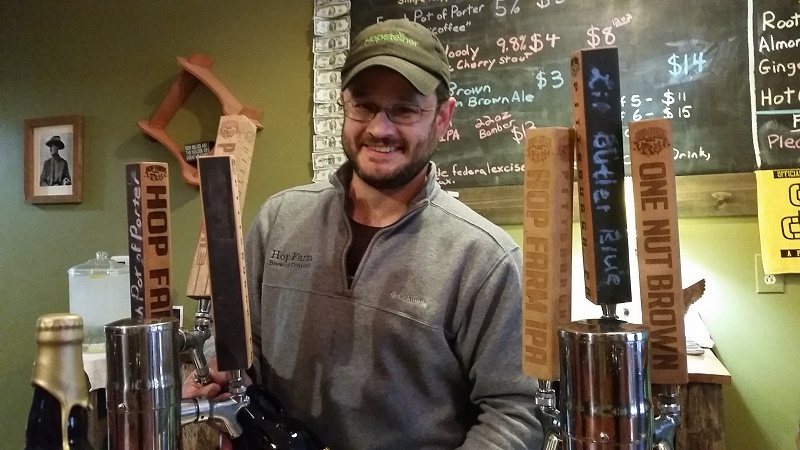 Matt Gouwens, owner of Hop Farm Brewing Co. in Lawrenceville. Hop Farm was an early addition to the development of Upper Lawrenceville. Five years ago, they bet on the future of this quiet stretch of Butler Street, moving into a narrow storefront at the corner of Butler and 56th St. long before the Mews on Butler residential development had broken ground. With great beer and a friendly vibe in their tiny taproom, Hop Farm soon became a staple of the local craft beer scene (known for growing their own hops, hence the name). The brewery is also known around town for its proud devotion to canned beer and its creative seasonal flavors, which this month include Cupid’s Wicked Woody Stout and Strawberry Cream Ale. Hop Farm is now in the perfect spot to take advantage of the building boom happening in their neighborhood. Along with Mews on Butler, Hop Farm’s expansion project will join several other high-profile development projects underway in Upper Lawrenceville, including the possible repurposing of Nied’s Hotel and Bar and Arsenal Strength’s new digs. Beginning as a narrow storefront, Hop Farm will now stretch into the former Arsenal Strength gym space. Arsenal Strength General Manager Vincent Camps said the move will enable the gym to add additional parking and shower facilities that it currently lacks. “It’s going to be an awesome situation for all parties involved,” says Camp. Stay tuned for details as Hop Farm gets closer to opening its expanded production space and tap room. At the moment, in addition to a rotating array of beers, the taproom also boasts a dining area serving oysters and lobster rolls. The second story above the bar is home to the Unplanned Comedy Warehouse, one of NEXTpittsburgh’s top romantic date destinations.